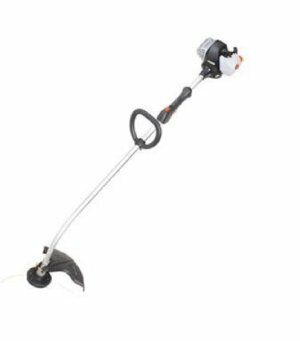 The Echo string trimmer is a high quality machine, with various grades of quality designed for the homeowner to the professional.. This is a serious machine, with serious quality. Echo has partnered with Home Depot, for the lower-end machines geared for the homeowner. Many professionals use the Echo trimmers. The Japanese engineering is among the best. Echo has been around in the USA since 1978. Lawn care product production began in 1979, with the GT-200 grass trimmer. Now the Echo string trimmer is accompanied by a wide range of equipment, to include chain saws, blowers, and hedge clippers. The Echo string trimmer product line starts with the Model GT-225 . This is typical flex shaft homeowner machine, with a string cutting head on the end of a 48 inch curved shaft. The engine displacement is 21.2cc, and the dry weight is a modest 10.2 lbs. A shoulder strap kit comes as an added accessory. The price for this basic homeowner trimmer is $159.99. The Echo string trimmer Model GT-225i is closely related to its brother, the model GT-225. The engine, shaft length, and cutting head all remain the same. The difference lies in the “I-75” starter system. This is not an electric starter, but an innovative pull rope starter that decreases the effort needed to start the engine. This could be a big advantage for those trimmer operators that are weaker, and have a hard time pulling the rope. Echo accomplishes this feat by having additional springs in the starter assembly, which adds a little weight and bulk to the machine. The price is also increased, bringing this trimmer to $199.00. The Echo string trimmer GT-230 would be considered a higher quality homeowner machine, or a low end commercial unit. The engine size has been increased to 22.8cc. A 52 inch curved shaft gives greater reach under bushes and obstacles. The cutting head is 2 line (increased balance with less vibration) and is advanced by tapping on the ground (identified as the Echomatic cutting head). Weight is slightly increased, at 11.5 lbs with the cutting head. The warranty is 5 years for a consumer, and 2 year commercial user. The price is a reasonable $249.99. Prefer to have the I-70 starter system on this machine? Sorry, you will need to look at the SRM model series for that option. Starting with Model SRM-225 Echo moves into the higher priced straight shaft models. The SRM-225 is powered by the 21.2cc engine, and boasts no straight shaft trimmer is more fuel efficient. This should also translate into fewer exhaust emissions, also. Although this is a straight shaft trimmer, the drive shaft is not composed of solid steel, as is the case with the more expensive models in this line. Instead, the shaft is a 4 layer cable. Straight shaft trimmers tend to weight more - this unit is 12.1 lbs with the cutting head. A twin line nylon feed head has been upgraded to the “Speed-Feed” design, that allows faster replacement line loading. Accessories include a cultivator attachment, that could be a big help in small gardens and flower beds. The price for this low-end straight shaft trimmer is a surprising $219.99. Prefer to have the I-75 starting system? Upgrade to the Model SRM-225i for $259.99. The engine, cutting head and shaft specifications remain the same as the SRM-225. Echo Model SRM-230 continues the trend of excellent straight shaft trimmers. The SRM-230 is powered by a larger 22.8cc engine. The straight shaft again is a 4-layer cable design, with a respectable curb weight of 12.2 lbs. The starting system is the standard pull rope. “Speed-Feed” cutting head is again standard. Available accessories include bicycle handles, metal grass blade, and cultivator. The cost for this ‘king of the hill’ homeowner machine in $289.99. Now for the commercial machines offered by Echo. The SRM series is designed with the professional in mind, with higher displacement engines, higher capacity cutting heads, and higher up-front costs. The Echo Model SRM-266S is a nearly identical model to the SRM-266, but it is equipped with a solid steel drive shaft. Solid shafts are much more efficient at transferring the engine power to the cutting head, and offer a more brisk acceleration of the cutting head, and improved overall performance. The weight remains essentially the same. The same lack of attachments remains, however. The upgraded shaft design increases the price of this sweet machine to $339.99. Model SRM-266T has the identical displacement as the other 266 models (25.4cc), but it boats a higher torque engine. Echo states the 266T has 50% more cutting torque than the other versions of the trimmers in this series. The shaft has returned to the 4 layer flex shaft. An extra heavy duty vibration dampening system has been added. The cutting head remains the high capacity Speed-Feed design. Adding cutting torque ads to the price of this workhorse, which is $339.99. Some customers are going to demand the very best of the Echo line. For these discriminating and demanding buyers, there is the SRM-280 line. Engine size has been increased to an impressive 28.1cc. Accessory availability returns, to include steel blades, bicycle handles, and a cultivator attachment. The Echo Model SRM-280 gas a 4 layer cable driveshaft, with an ECOmatic Pro cutting head. The engine vibration reduction is extra heavy duty. Weight remains competitive at 13.4 lbs. List price for this commercial machine is $369.99. Model SRM-280S is equipped with the top of the line solid steel shaft, providing better performance and cutting head acceleration. The price is increased to $399.99. Topping out with the most torque of any Echo trimmer, Model SRM-280T returns to the 4-layer cable design. Torque is increased by 50% when compared to the other models in the SRM-280 line. The increased torque does not increase the weight, which remains at 13.5 lbs. The price also remains the same, coming in at a cool $399.99. Echo string trimmers offer much to the homeowner and light commercial users. Many consumers will find the convenience of an association with Home Depot too good to pass up.